Notre Dame Physics was well-represented at the DNP 2017, which is the fall meeting of the Division of Nuclear Physics of the American Physical Society. 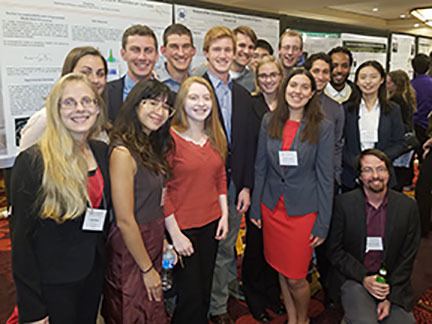 Many physics majors, graduate students, postdoctoral researchers, and faculty members attended, as did multiple 2017 ND-REU participants from other universities. Prof. Anna Simon and Dr. Patrick O’Malley, postdoctoral research associate, acted as session chairs. Just a few of the attendees are pictured here. Originally published by Shelly Goethals at physics.nd.edu on November 02, 2017.